Keep your camera ready as you cruise in a Zodiac in search of whales, seabirds and astounding icebergs. Beaches dotted with leopard seals and penguins give way to icy plateaus, with snow- capped mountain peaks looming behind. You’ll find yourself thankful for the near-constant sunlight by which you can continue to take it all in. Chinstrap penguin calling his mate. Photo by a Quark passenger. Your adventure begins in Punta Arenas, Chile, the most populated city in southern Patagonia. If you arrive early, there are many museums, restaurants and shops to keep you busy for days. By early afternoon, a Quark Expeditions® representative will meet you at the official starting point hotel, where you’ll enjoy a welcome dinner and be briefed about preparing for your embarkation day. Your charter flight from Punta Arenas to Antarctica will have you crossing the legendary Drake Passage in only a few hours. Far below, the ship will approach King George Island for your arrival. Your first glimpse of dramatic Antarctic landscapes will be from a unique perspective, as your plane descends for landing in the South Shetland Islands. After landing, stretch your legs with a one-mile (1.6 km) walk to the shore, before being transferred by Zodiac to your ship to set sail for the Antarctic Peninsula! There are few places in the world as evocative as Antarctica. As your ship approaches the White Continent, you may be overcome by feelings of excitement and awe. Antarctica is indescribable and can only be fully appreciated through your own eyes. As your captain and Expedition Team keep a lookout for whales and seabirds, you’ll be alerted to any new sightings. Our team of expert presenters will deepen your experience with explanations of the glaciology, history and wildlife of the region. Even more exciting are your daily excursions. Your first Zodiac landing is something you’ll never forget! Walking on a beach dotted with penguins is the most intimate way to experience the unique wildlife of Antarctica. Each landing is different and is dependent on weather, but every day presents new sightings and photo opportunities, and it won’t be long before you can tell the difference between an Adélie, gentoo and chinstrap penguin. You may take a Zodiac cruise in search of whales and icebergs one day, followed by a hike to a penguin rookery the next day. From the booming sound of a calving glacier to the thrill of spotting apex predators like leopard seals and killer whales in action, you’ll wake up early and welcome each day with a sense of adventure and a desire to explore during this unrivaled travel experience. Your Expedition Team will accompany you all along the way, providing insights into the places you visit. After your week of exploration, you’ll say goodbye to your Expedition Team and disembark at King George Island. 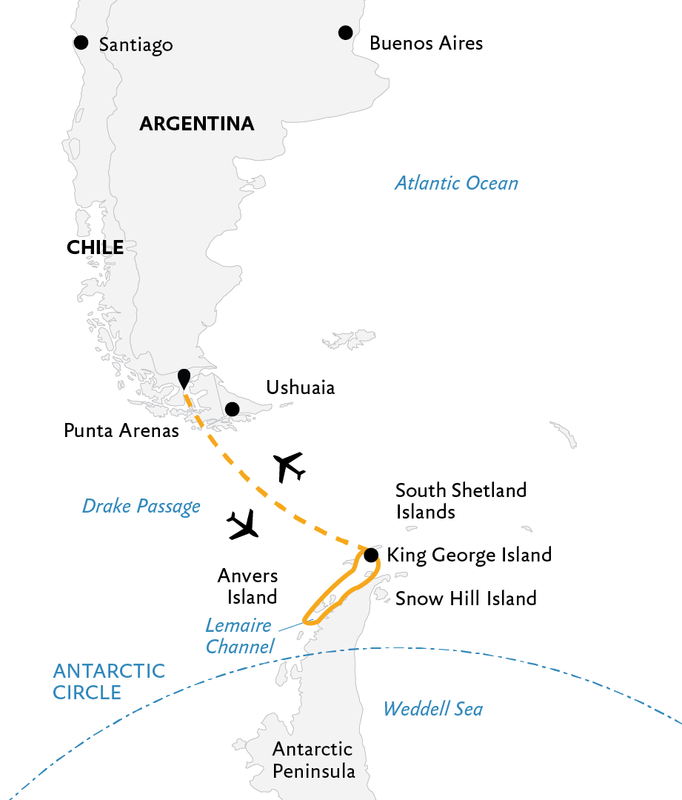 Your two-and-a-half-hour flight across the Drake Passage to Punta Arenas, Chile, brings your adventure to an end. After your group transfer to the hotel, you are free to explore and enjoy an evening on your own, in the city or at the hotel to reminisce about the sights and sounds of Antarctica. Incredible people, ship, food, hospitality - just hands down the best tour I've ever been on. I highly recommend this trip! This was the most amazing experience! The expedition crew was brilliant from Shane who was there everyday to make sure everyone gets onto land dry; Meghan with the stand up paddleboard excursion; Ruslan who happened to be our Zodiac guide for most of the excursions and Ed for sharing his Everest experience, to the rest of the crew. Everything was impeccably organised. Hope to see you all in the North Pole one day! The trip started out well. The weather was fine. 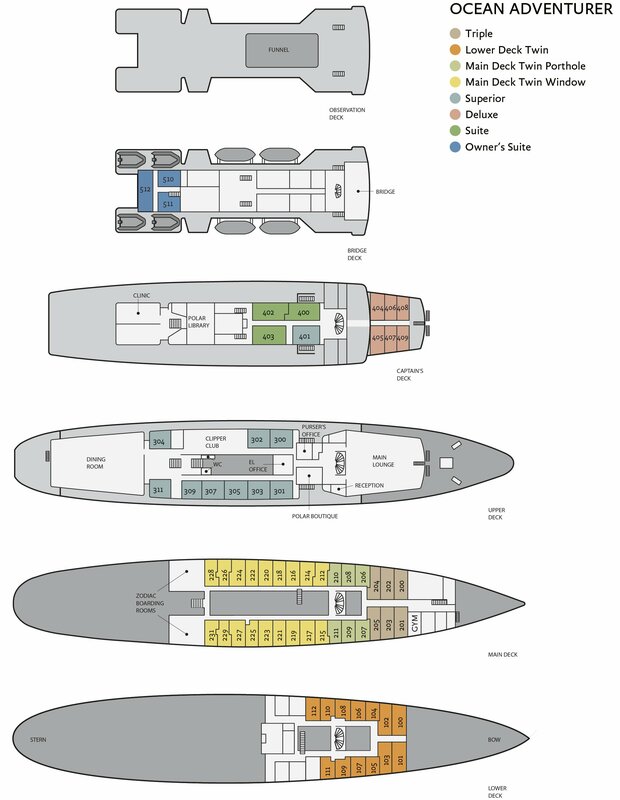 Not only is the ship quite comfortable, but the expedition team is excellent. We all enjoyed experience and learned a lot. The cabins, dinning facilities and service, lounges, etc are all satisfactory and good. Of course, our trip also had some extraordinary experiences-- due to bad weather, our return flight was delayed five days. Needless to say, the anxieties caused by the uncertainty were high during the delayed period. But the staff was top-notch and dealt with this unexpected long delay (we were told we set the weather related delay record for the Quark Antarctic expeditions). Still, all passengers were treated well. No shortage of anything. In fact, the staff team actually tried to do some extra landings during the wait. In the end, despite all the delays and disruptions, we were all able to safely get home. A major downside of this delay is the financial loss for those of us whose flights and lodging had to be cancelled, changed, or rebooked. This makes purchasing travel insurance that can cover such unforeseen problems that much important. Overall, Quark did the very good job. We would go with Quark for some other expedition trips.